First of a few shots of this car being built. 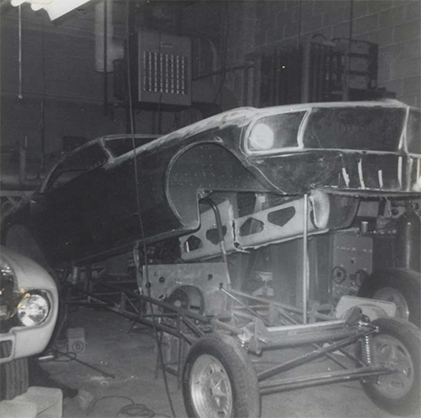 Tom Smith built the body but this is not his shop. My understanding is that he was another person’s facility at the time…before he got his own place. EDIT: I was wrong. Paul Shedlik built the body and Tom Smith did the tin work. Thanks to Daryl Huffman for that info! Great photo Jeff! really shows just how much work went into fabricating that car/chassis. Jeff, Paul Shedlik made this body. Along with Gas Ronda, Tasca Ford Bill Lawton, Tommy Grove, Jack Chrisman,Paul Stefansky, Frantic Ford, and Jerry Caminitos Holeshot. Thanks Daryl! I just had a email conversation with Mr. Shedlik. Sent him some pics of this one. Don`t forget me too ! Looks like the cage hasn`t been shortened yet. Tom Smith did do all the tin work on the body.